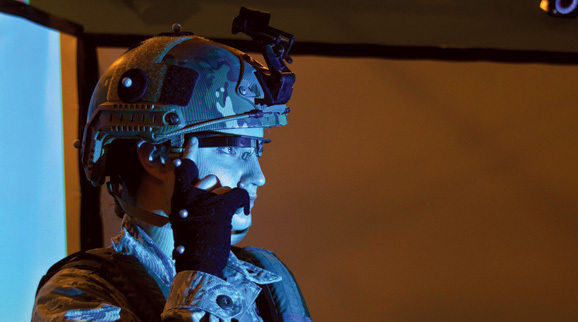 The Israeli Defense Force (IDF) continues to be at the forefront of communications and target acquisition, and informational technologies for the dismounted soldier. The R&D in these modernisation efforts are conducted by the IDF’s Development Branch. Recently this branch has been inspired by “Google Glass”-like technologies that can provide real time information on the battlefield for increased situational awareness and protection of IDF soldiers. “After Operation Protective Edge, there became a greater understanding that mobility is a significant factor in combat,” said Capt. Rotem, Head of Development Branch. “One of the things we’re working on is a change in the perception of mobility within the development branch of the IDF. In the coming year we will learn how to develop and utilize Android apps, and enter the realm of multi-faceted technology”. A priority among those apps Rotem’s branch is working on, is the development of a wearable Google Glass type of technology that could provide soldiers and commandos in the field with real time data from central command. “Of course the goal is not to confuse, but to add information that can help fighters make correct decisions – to prevent firing at our forces [or non-combatants] for example,” said Capt. Rotem. Taking the lessons learned in the mobile logistics app, into a true wearable screen such as Google Glass, will be a big step forward in soldier safety and improved situational awareness says Rotem. Incidentally, IDF is not the only military looking into the potential of Google Glass, The U.S. Air Force’s Battlefield Air Targeting Man-Aided (K)knowledge programme (BATMAN) purchased two of the units, and has been experimenting with leveraging similar apps for the USAF. Moshkovitz says, “Soon everything will be cyber,” and IDF personnel need to be leaders in this area. He likens today’s “cyber warfare” to the early days of air warfare, where since WWII superior air power has made the difference in almost every modern conflict. The same will be said for who leads the way in cyber warfare and cyber defense.